I’ve always loved this deli favorite but never tried to make one at home until now. It turns out that the secret to a good Reuben sandwich is the dressing, which is always a creamy tomato based salad dressing like Russian or Thousand Island. Luckily I had just started making my home made Russian dressing when I decided to make my own Reuben sandwich. Ingredients for 8 sandwiches: 16 slices rye bread (I like the seeded variety) 8 slices Muenster cheese ¾ lb corned beef brisket, thinly sliced ½ lb sauerkraut, canned or bagged, drained, more or less to your taste ½ cup, more or less to your taste Russian dressing If you want to make this a cold sandwich then just assemble the ingredients in any order you want, and enjoy! But if you want a hot sandwich then you have a couple of options. First, you can assemble your Reuben and then butter both slices of bread on the outside and pan fry it on your stove-top on medium low heat. It is tricky to completely heat the sandwich filling and melt the cheese without burning the bread so keep the heat on medium low and be patient. You can speed up the process by keeping the heat low but covering the sandwich on the frying pan with the cover to one of your 3 quart pots. Want to cheat? For a faster and lower fat option you can assemble just the meat, a little dressing , then the cheese and sauerkraut (in that order) and microwave it on a small plate until the cheese melts. Toast the bread lightly and when it is done spread both slices with some more of the dressing then use a spatula to scoop up the microwaved filling and place it on the bread to make your sandwich. You can make an open faced version of your Reuben this way too. 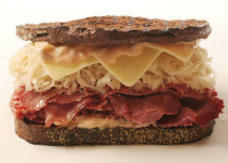 Next I am going to try to bake my Reuben ingredients into a home made rye bread loaf – stay tuned! Optional: Substitute some or all of the corned beef with thinly sliced pastrami Substitute Thousand Island dressing for the Russian dressing Some Reuben recipes call for Swiss cheese but I think it’s harder to melt than Muenster. Try the Swiss and see for yourself Try mozzarella cheese if you are looking for a change. It also melts well. Purists may prefer pumpernickel bread, but you can try any dark and flavorful bread.